GlobalFoundries, AMD’s former chip manufacturing arm, is a fab that has seen some hard times. After being spun-off from AMD in 2009, the company has encountered repeated trouble releasing new manufacturing nodes in a timely process, culminating in the company canceling their internally developed 14XM FinFET process. Charting a new course, the in 2014 the company opted to license Samsung’s 14nm FinFET process, and in some much-needed good news for the company, today they and AMD are announcing that they have successfully fabbed AMD’s first 14nm sample chip. Today’s announcement, which comes by way of AMD, notes that the fab has produced their first 14nm FinFET LPP sample for AMD. The overall nature of the announcement is somewhat vague – GlobalFoundries isn’t really defining what “successful” means – though presumably this means AMD has recieved working samples back from the fab. Overall the message from the two companies is clear that they are making progress on bringing up 14nm manufacturing at GlobalFoundries ahead of mass production in 2016. Of particular importance in today’s announcement is the node being used; the sample chips were fabbed on 14nm Low Power Plus (LPP), which is Samsung’s (and now GlobalFoundries’) second-generation 14nm FinFET design. 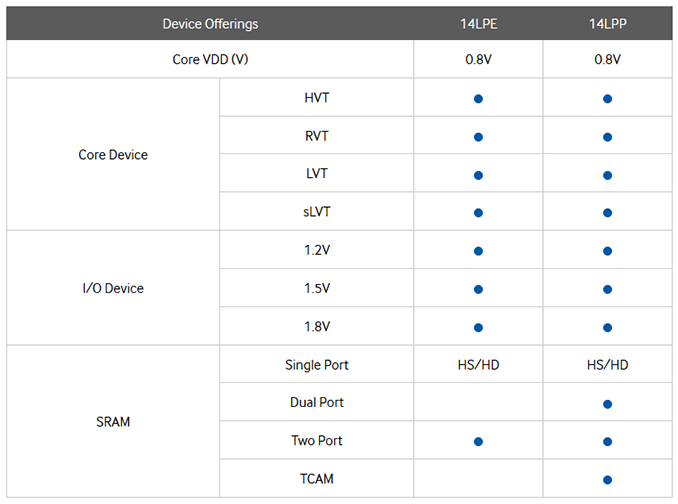 Relative to the earlier 14nm Low Power Early (14LPE) design, 14LPP is a refined process designed to offer roughly 10% better performance, and going forward will be the process we expect all newer chips to be produced on. So in the long-run, this will be GlobalFoundries’ principle FinFET process. AMD for their part has already announced that they have taped out several 14LPP designs for GlobalFondries, so a good deal of their future success hinges on their long-time partner bringing 14LPP to market in a timely manner. For today’s announcement AMD is not disclosing what chip was successfully fabbed, so it’s not clear if this was CPU, APU, or GPU, though with GlobalFoundries a CPU/APU is more likely. Though no matter what the chip, this is a welcome development for AMD; as we have seen time and time again with chips from Intel, Samsung, and Apple, a properly implemented FinFET design can significantly cut down on leakage and boost the power/performance curve, which will help AMD become more competitive with their already FinFET-enabled competition. Finally, looking at the expected timetables, GlobalFoundries’ production plans call for their 14LPP process to enter the early ramp-up phase this quarter, with full-scale production starting in 2016. Similarly, in today’s announcement AMD reiterated that they will be releasing products in 2016 based on GlobalFoundries’ 14LPP process. These production chips are Zen as Arctic Islands is coming out of TSMC. All they need now is to work on yields. Under perfect conditions, Zen can be out in late Q2 next year. AMD may actually come in earlier to market than expected with Zen. Technically, the shortest time period from sampling to mass production is only a few months, but it is always longer since so much work needs to be done to verify that you want to go ahead with full production. It is conceivable, but it would be unheard of, for AMD to be completely satisfied with the initial silicon, yields, AND be ready with the platform by the end of Q2. Especially with a completely new design on a complete new process.